A decent bike rack is hard to find in Savannah. I have a future in product design. I plan to specialize in universal domain technology, remain small and focused, invent things that I need, use all the potentially useful materials that clutter house, yard, and tool shed, and produce prototypes rather than patents. Neither Benjamin Franklin nor Thomas Jefferson believed in patents. I’m on their side. Patents foster secrecy, such that everybody is so busy working alone and spying on “competition,” that we have a technological revolution of incompatible electronic equipment. Above left is a bicycle rack, with my lone bicycle parked in it. 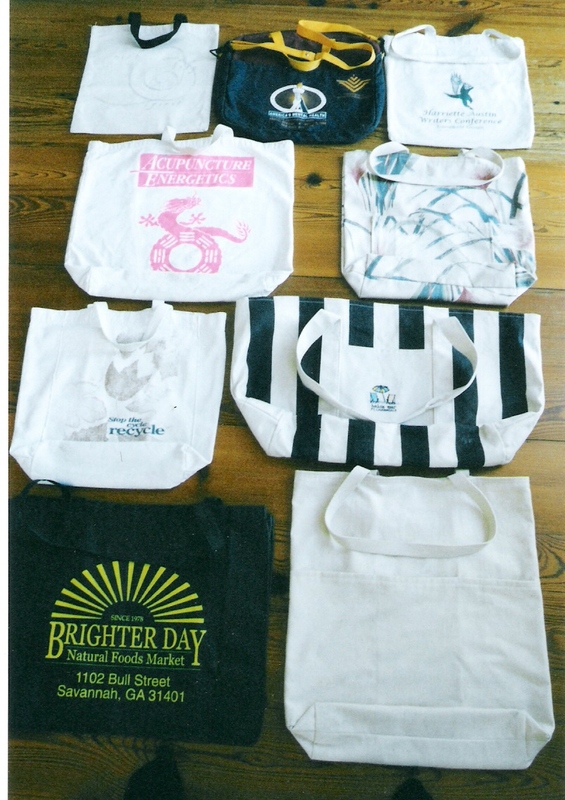 Above right is my reusable shopping bag collection, two of them hand-sewn by yours truly. I used left-over drapery material to make the floral one. 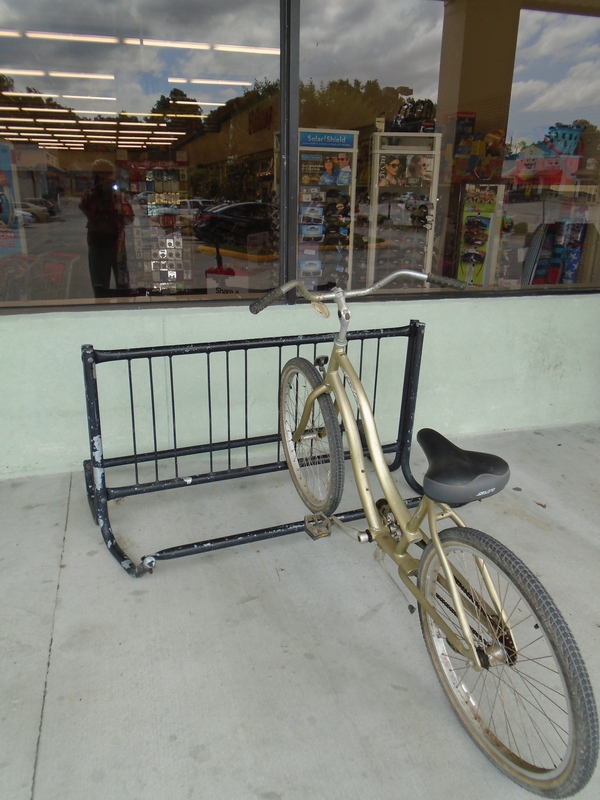 The bike rack is part of a local campaign to embarrass our city and county government into making our streets and sidewalks more wheel friendly. I’m also on a picture-taking campaign of public safety hazards on public land, planning to e-mail said pictures to those who are wasting taxpayer money on new highway construction and new schools where nobody lives. Public safety hazards on public land abound in Savannah, where I live, but this appears to be a national problem. Think of all the wheels that must traverse these areas. Not only bicycles, but wheelchairs, rolling walkers, shopping carts, delivery carts, skateboards, roller skates, as well as cars and trucks. In Savannah, tree branches hang in front of traffic lights and street signs. High curbs, speed bumps, little islands of bushes at eye level prevent drivers from seeing small children and oncoming traffic. Drainage is another major problem in this backwater burg. The city and county do not maintain the drainage ditches, such that the mosquito problem is magnified. When we have heavy rain and high tide together, downtown and midtown Savannah are prone to heavy flooding. Our city parents (fathers and mothers) solve these problems by purchasing cute but loud little yellow jacket helicopters to dump malathion on the entire coast. They purchase street signs to tell us the street is closed when flooded. The helicopters pay special attention to the largest mosquito nest in Georgia and South Carolina that sits on the northern bank of the Savannah River. This is site of previous Savannah River dredgings. Our famous Hutchinson Island is an earlier site. These toxic waste dumps come to us courtesy of the Army Corps of Engineers, but the Corps pays Chatham County to control the mosquitoes with malathion. They do not want to drain it, because it attracts birds, but the birds and racoons are showing dangerous levels of lead and other toxins. Yet the Corps and the county and the state of Georgia are hot to deepen the Savannah River even more, from 42 to 47 feet, even though nobody knows where they will put the millions of tons of toxic waste accumulated over 250-plus years of industrialization. This ambitious project to stimulate imports and exports comes at a time when the “global economy” is dying on the vine. The dollar is strong right now, great for the domestic economy. Domestic goods are cheaper, labor is cheaper. Only the bankers, the governments, and Wall Street are suffering, because they are the profit-skimmers who produce nothing of value on their own. How do I get from bike racks and reusable bags to the global economy? It’s simple. Anyone can make them. No patents or patent attorneys required. They give solid, dependable returns on time and money investment for years, and cost nothing in taxes. This entry was posted in Environment, GoverCorp and tagged bike racks, biking, drainage, environmental toxins, flooding, lead, mosquitoes, public health, public safety, recycling, repurposing, reusable shopping bags, Savannah, Savannah River, sidewalks, streets, taxes on August 29, 2015 by katharineotto.